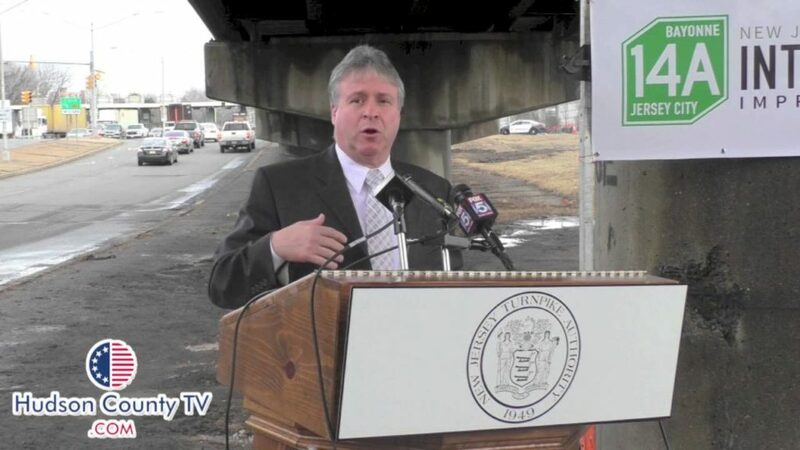 Mayor Jimmy Davis announced that the New Jersey Turnpike Authority and its contractors have provided new information to the City of Bayonne about the reconstruction of the area around the 14A toll plaza. In the ramp area East of Route 440, asphalt paving will be taking place on Chosin Few Way and Ramp “O” from the northbound side of Route 440 to Port Jersey Boulevard. This paving will occur during the next few weeks. During the week of April 25, the northbound Route 440 ramp will be shifted onto a new alignment and tie into Port Jersey Boulevard. In early May, traffic will shift onto Chosin Few Way (between Port Jersey Boulevard and Pulaski Street). Construction will continue on the new abutment for the Connector Bridge between Port Jersey Boulevard and the Turnpike. Installation of concrete columns and a new embankment will move forward, along with construction of a mechanically stabilized earth (MSE) wall. At the intersection of Pulaski Street and Route 440, utility work will continue. Northbound and southbound Route 440 traffic has been shifted to create a median work zone. Temporary traffic signals have been activated. Deep foundation work will continue for the new Connector Bridge between the Turnpike and Port Jersey Boulevard. In early May, the northbound side of Route 440 will receive an alternate traffic pattern. The northbound travel lanes will be split. In mid-May, construction crews will begin erecting structural steel along Avenue E for the new Connector Bridge between the toll plaza and Port Jersey Boulevard. Work is continuing on Connector Bridge approach retaining walls near 53rd Street. New bridge pier cap and column construction work will continue, along with drilled shafts for the new structure. Deep foundation work will continue along the New Jersey Transit Light Rail tracks on the former Daibies gas station property. Widening work will continue on the ramps between the 14A toll plaza and the Hudson County Extension. Asphalt paving will take place during the week of April 11. Local street-level work on Kennedy Boulevard, Avenue C, and Garfield Avenue bridges requiring lane closures will continue. Single daytime lane closures will be used as needed. Temporary support towers will be located below the Avenue C bridge. Sidewalk passage will be maintained. Work is continuing on a new variable message sign at the base of the Newark Bay Bridge. A temporary barrier curb along the ramp west of Avenue C will be removed on the weekend of April 22. The ramp work zone will switch to the left (median), and all traffic will be pushed in the ramp area to the outside shoulder on the weekend of April 22. In the toll plaza area, renovation work will continue at the existing toll plaza building. New east toll lane construction is continuing. Toll lanes 1 and 2 will open in late April, while toll lanes 3 and 4 will close. During the weekend of the opening, northbound Avenue E will be reduced temporarily to a single lane between 52nd Street and the toll plaza to implement the change.